In 1882 – the same year the Academische feestmarsch (Academic Festive March, RC 2) was composed – Diepenbrock wrote his first setting of Goethe’s Wandrers Nachtlied (Wanderer’s Night Song). Later he said about this four-part work for male choir: It [...] is very mediocre and proves that, at the age of 20, I was still a helpless dilettante. (BD VI:13) It is not possible to verify this intriguing statement as the manuscript has been lost. 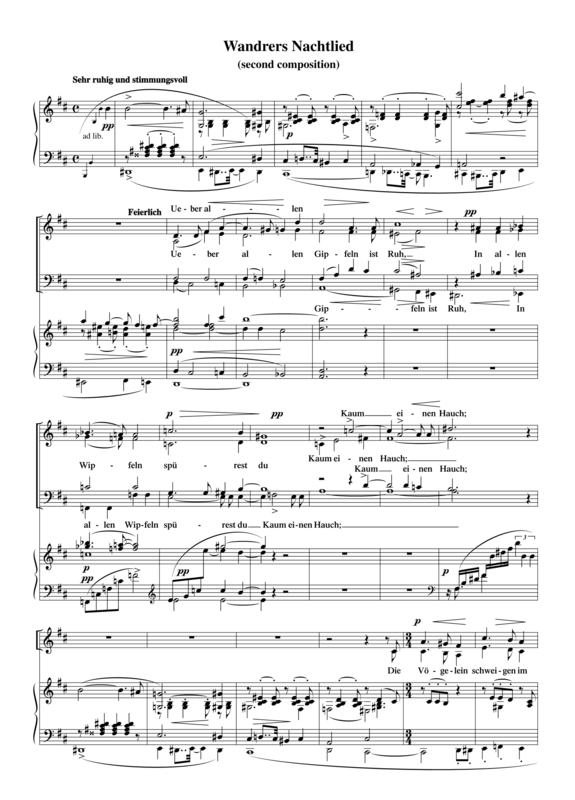 At the end of October 1886 (after passing his final exams in Greek and Latin) Diepenbrock started to set Goethe’s poem to music for the second time, now in a version for alto, tenor, baritone, low bass and piano. It is not known whether this unusual combination of voices was prompted by the type of voices Diepenbrock had at his disposal among his circle of friends and acquaintances, or whether it was based on artistic grounds. The piano starts the six-measure introduction with the unusual chord progression D-sharp dom7 chord – e minor, which is repeated a major second lower (C-sharp dom7 chord – d minor). The setting of the vocal ensemble is characterised by smooth harmonies with many minor second progressions. Rhythmically the vocal parts are much differentiated. Interestingly, the piano recalls the first three measures, “Über allen Gipfeln” (Over all summits), in measures 33-35 - the work consists of 49 measures in total. Material of this composition was incorporated into the third setting of this text by Goethe which Diepenbrock wrote for a cappella vocal quartet in 1908, and which he completed in December 1916 (see RC 86), making Wandrers Nachtlied the poem that inspired Diepenbrock for the longest period of his career.